Kiva.org, one of the pioneers in micro-lending to entrepreneurs, is entering the educational space today, launching the pilot program of student microloans on the platform. Kiva is a peer-to-peer lending site that began as a way to facilitate micropayment loans between citizen lenders and extremely low-income entrepreneurs in developing countries, Through Kiva’s platform, anyone can loan $25 or more to support an entrepreneur and the specific progress of the loan can be tracked from initial funding to repayment. Upon receiving repayment, lenders can withdraw their funds from Kiva or lend again to another entrepreneur, thereby continuing the lending cycle. Most of the entrepreneurs who benefit are in developing countries, but last year Kiva opened up its service to needy U.S. entrepreneurs last summer (which caused some controversy). It also has APIs for other developers to build on its data set. With the Student Microloans program, now anyone can lend as little as $25 to students in Bolivia, Paraguay and Ecuador to to fund their educations. Similar to the way the organization handles its small business loans, Kiva is working closely with its Field Partners in the three countries to find students and to create a loan offering tailored for the countries’ students. In some cases, Kiva is providing the additional reach needed to fund its current portfolio of student loans and, in another case, Kiva’s partner is creating their first ever student microloan offering. 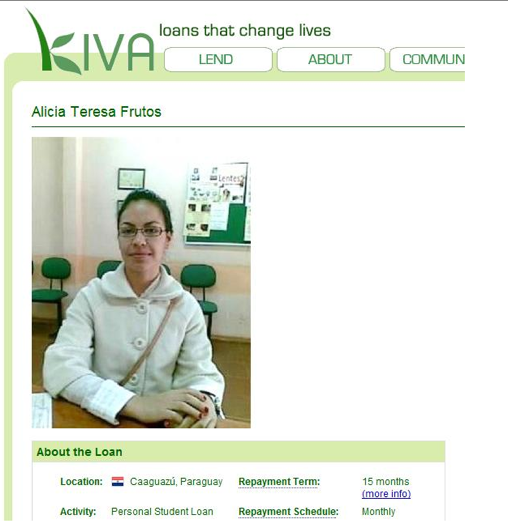 As with other Kiva loans, the progress of the loan can be tracked from initial funding to repayment. Typically, students have between one and three years to pay back their loans. Upon receiving repayment, lenders can withdraw their funds or re-lend to another student or entrepreneur. Alicia Frutos is from the city of Caaguazú. She is 23 years old and in her fifth year studying Legal and Notary Sciences at Universidad del Norte in Caaguazú. Alicia has a 22 year old sister who graduated with a degree in Accounting from the same school. Her mother has a business renting out tables and chairs for social events, while her father works as a merchant. Alicia currently works as a registrar at the courthouse, where she is gaining experience while earning an income to help pay for her studies. She is eager to finish her degree so that she can open her own law practice, grow professionally, and be recognized for her excellent work as a lawyer. Alicia is requesting a loan to pay her monthly tuition. Since she is seeking to complete two degrees, the cost is quite expensive. Kiva has been growing like a weed since its launch in 2008. Currently, over 477,000 people have loaned more than $150 million to 408,000 entrepreneurs in 53 countries via Kiva. Kiva’s repayment rate thus far (for entrepreneurs) is 98 percent and the startup is raising $1 million every 5 days for small businesses. The move to help fund student short term loans in developing countries seems seems like a natural transition for Kiva, but CEO Premal Shah reinforces this is still a pilot program and the startup is still waiting to see how the program fares before extending it to other countries. Of course while Kiva pioneered the model of using microlending to fund small businesses in developing countries, another startup, Vittana, launched its microlending marketplace for student loans last May.